We see ourselves to provide a reliable, comfortable service that takes the worry out of arriving at the airport in time for your flight. We collect you from your pick up point and will be waiting for you as soon as you land off the place on the return date.
" Just a quick email to thank you the coach driver last night. We was very helpful, pleasant especially with the slight change in times. The children had a wonderful time. From - Pendle Primary Academy "
" ‘Just a quick email to say thanks for the courteous , friendly and professional service you provided, the drivers were both excellent my family will definitely use you again and will recommend you to others (which you were recommended to us) Thanks again’ "
" ‘I would just want to pass on my thank you for this weekend. Our coach was lovely and the bus was lovely to. Definitely be using you in the future.’ "
" ‘your driver was a very nice man, and a steady driver. He waited patiently for everyone. Was early to collect us and got us there in good time. 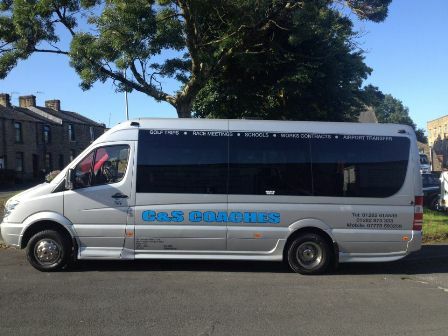 The coach was very new and comfy and so relaxing’ "
" Just a quick email to say a big thank you to the gentleman driver from our school trip to the Phones4U Arena, Manchester last Wednesday, you were helpful, obliging and very pleasant to deal with. Our children enjoyed the experience of singing at the Arena and had a wonderful time. For and on behalf of the teachers, support staff and parents of Pendle Primary Academy. "